I’ll start off by saying, No, this isn’t a card game similar to top trumps. It’s not even a game at all. Nick over at Arachnid Labs designed a series of playing cards with a little electronic circuit and description printed onto each one. His original idea was to include one with every item ordered from his product range as a fun little gift. The cards were such a hit that he was soon inundated with requests from customers wanting to buy the full set. Nick did the only thing he could…. he obliged and had more sets printed up, designed a nice looking box for them and sold them as a product in their own right. Great news for the rest of us! We first saw these cards for sale on Tindie but by the time we came to order, the cards were also stocked on Amazon so we ordered from there. Tindie charge $14.95 and Amazon charge £8.99. Let’s start with the box itself. As boxes go, it’s actually pretty nice. It’s obvious that as much thought went into the packaging as the cards themselves. It has a well printed satin finish with the Arachnid Labs logo on one side and a brief description of it’s contents on the other side. The pack on my photos is a bit tattered because I’ve had them for a while now and can’t stop playing with them but it did arrive in perfect condition. On to the cards themselves. 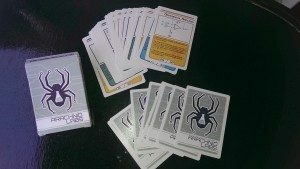 There are 32 cards in total, each with a different circuit and description printed on one side and the Arachnid Labs logo printed on the other side. Each card is also colour coded to show which type of circuit it is. Yellow for digital, blue for analog and green for power. The top half of the card shows the schematic drawing and the lower half contains the description. Ever wondered what an SR latch is and how to use it? There’s an app card for that! The quality of the cards is also quite surprising at first. To be honest, I was expecting to find a set of cards printed on standard card stock but instead found each card to be actual playing card material. They look and feel like actual playing cards. I think it’s a nice touch. Another thing that is clear about this set of cards is that it wasn’t just thrown together. The circuits shown are actually useful circuits and not just random ones chosen at random. I won’t list all the cards in the pack, that would spoil the surprise for when you order yours. All I can say is that this pack of cards is a great little addition to your desktop. You should treat yourself to a pack, you deserve it. They also make an excellent present for the geek in your life. If you’re looking for something a bit different, these cards are for you.